With over 1,000 species of wild flowers, the Isle of Barra is known as the garden of the Hebrides. Named after the patron saint, Saint Finnbarr, it’s an island paradise, measuring only around five miles across and eight miles long. If Paradise exists on earth, surely this must be that place…. 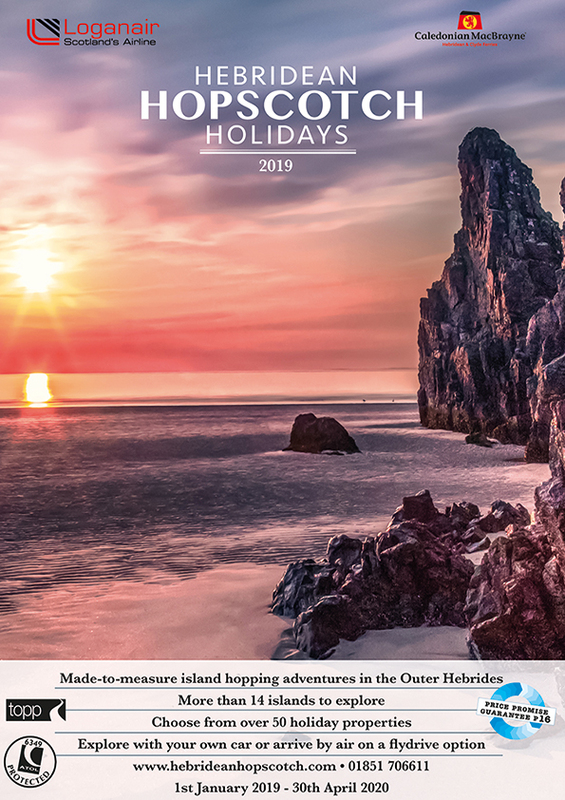 The Isle of Barra is the start or finish point for most car touring holidays in the Outer Hebrides, either by sea via the Calmac Oban/Castlebay route, or by air via Glasgow. Whether you should enjoy the unique experience of this wonderful community first or last is probably dictated by ferry timings and dates. 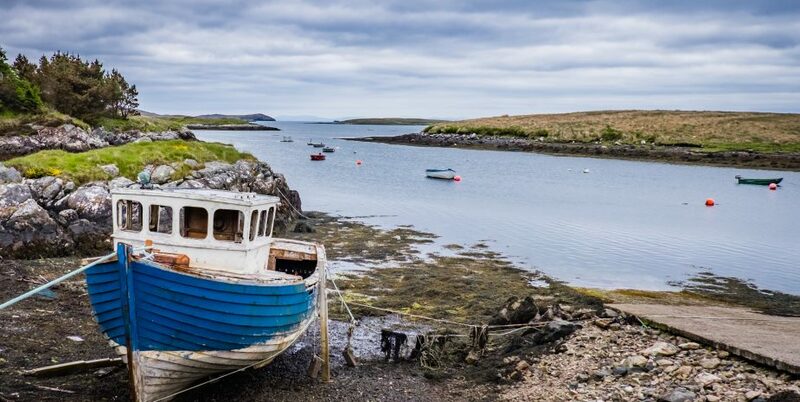 Rather than view the surroundings through the windscreen, perhaps Barra may tempt you to walk or cycle around this part of the western Isles – and get closer to the experience. Assuming you’ve arrived from the Uists, after leaving the ferry from Eriskay at the Aird Mhor ferry slipway follow the first signs to the airport. You’ll pass a delightful, sheltered, sandy beach at Crannag, then, beside the extensive sands of the Isle of Barra’s Traigh Mhor beach, you’ll see the terminal building. If the tide is in, however, the runways will be under several feet of water, receiving their twice daily wash! If the tide is out, maybe it will be the right time to joined the small crowd that gathers to watch the Glasgow flights landing and taking off on the beach. Of course, if you’ve chosen a flydrive holiday, you’ll have a memorable experience landing on, or taking off from, the beach. 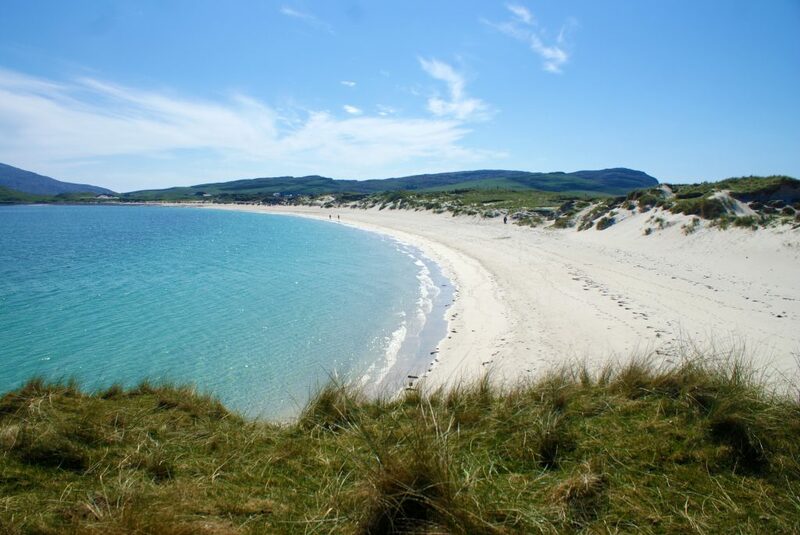 The Isle of Barra is claimed to have the only beach airport in the world accommodating scheduled flights! Beyond Traigh Mhor, at the edge of Eoligarry village the tiny Church of Cille Bharra was probably built around1500AD. In the chapel, there’s a replica of the ancient runic stone that stood here. 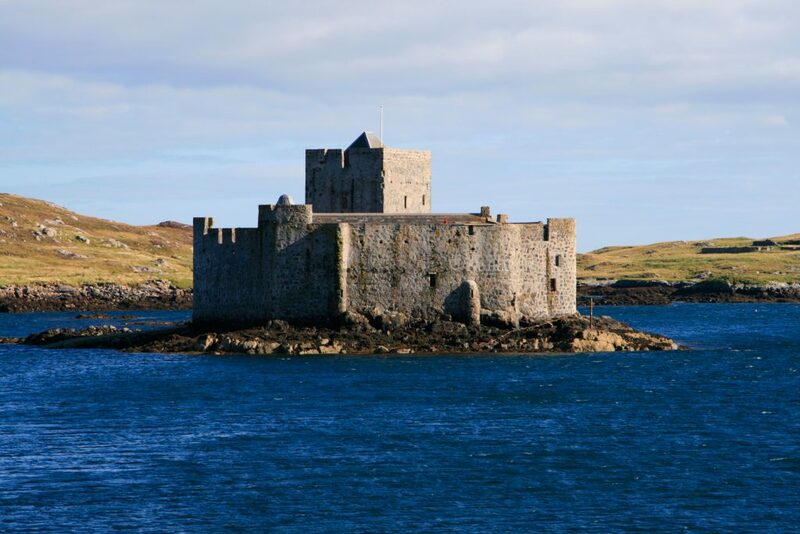 Returning to the attractive harbour village of Northbay, you join the main road – it does not matter which way you turn as a 30 minute, 12 mile drive will bring you back to where you started on this road that makes a circuit of the Isle of Barra. Taking the right hand route, you’ll immediately cross the central high ground of Barra, passing Loch an Duin before descending gently to the western side of the Isle of Barra. Off a lane to the right, there is a 9 hole, hillside golf course with fantastic views over the Atlantic coast. 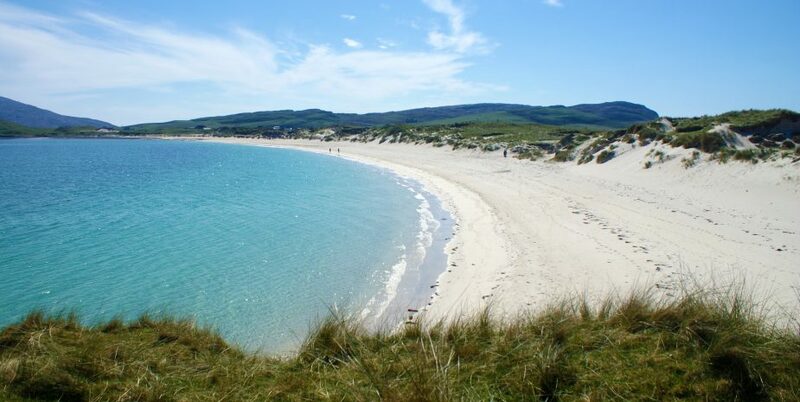 There is also a tiny settlement, Cliaid, nestling beneath the hills, alongside a delightful beach. It’s a pleasant place to spend an hour or so, perhaps with a picnic while watching oystercatchers on the rocks. At Craigston, the restored Thatched Cottage Museum (An Dubharaidh) is reached by walking up the track from the car park at the end of Craigston village. Craigston’s Catholic church of St. Brendan has a simple but exceptionally beautiful interior. 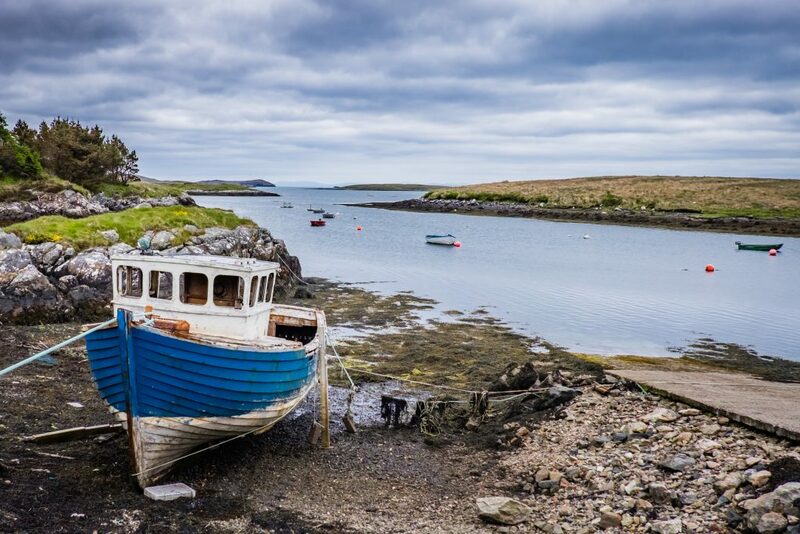 The road hugs the Atlantic coastline for around three miles, beside rocky shores and sandy beaches, with stunning land and seascapes awaiting you beyond each bend, before descending into Castlebay. Castlebay, ‘capital’ of the Isle of Barra, is quite a busy little village, with a modern supermarket, bank and a few independent shops. 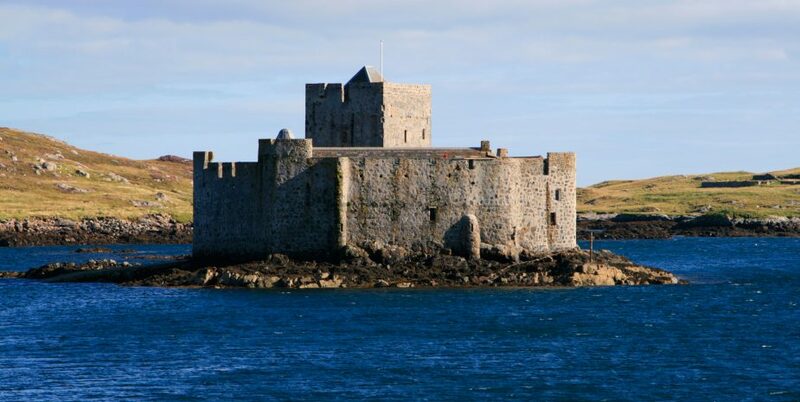 You can visit Kisimul Castle, proud home and symbol of the MacNeils, which sits majestically on exposed rocks in the bay and is made accessible to visitors by local boat operators. Beyond Castlebay as it returns up the east coast, the circular road winds around the rocky shores through small villages, some with harbours and jetties, until it arrives back in Northbay from the south. Along this route, Sheila’s home-made ice cream shop is great for a special treat. Other than residential roads, the only other significant turn off the circular road is one that leads to the most southerly inhabited Outer Hebridean island, Vatersay, which is accessed over a causeway. It has east and west beaches just yards apart and really must not be missed.